Chronic exposure to the sun can lead to aged or damaged skin in the form of wrinkles and lines, dark spots, uneven skin tone, dilated blood vessels and rough texture. This may cause you to appear older and/or unhealthy. 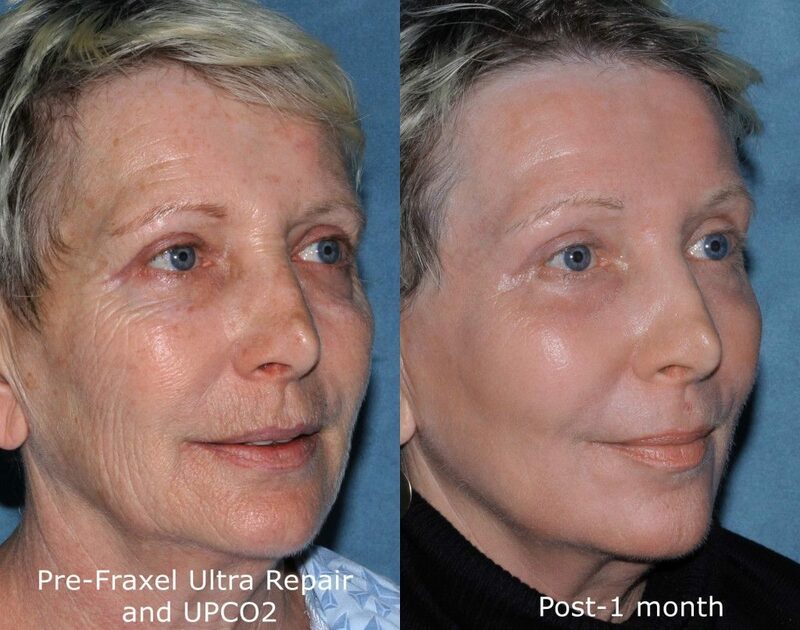 Fraxel Re:pair is a laser that significantly corrects aged or damaged skin with a technology called Fractional Deep Dermal Ablation (FDDA™), a type of fractional CO2 laser resurfacing. The laser works on a microscopic level; that is, it breaks the treatment area down into zones, or what would resemble pixels on a digital image. Then, zone by zone, the laser penetrates the dermis and resurfaces the uppermost layers of the skin. This means that unlike earlier laser technology, the Fraxel Re:pair laser only treats a fraction of the skin. Further, the laser stimulates both the body’s self-healing mechanism and boosts the natural production of collagen and elastin fibers. As a result, new skin cells are produced, and the skin structure is strengthened by the newly-created fibers. The result is tighter, smoother, and fresher-looking skin. At Cosmetic Laser Dermatology, our expertise is in the name. With 45+ lasers at our disposal, our board-certified dermatologists are cosmetic laser specialists with more than 100 years of combined dermatologic experience and research. We’ve provided expert treatment and compassionate support to over 150,000 satisfied patients for a wide range of skin conditions. Cosmetic Laser Dermatology is internationally renowned for its laser research and innovation. We are at the forefront because we’re committed to maintaining and even surpassing the industry’s strict guidelines and lofty standards. Our board-certified dermatologists are dedicated to advancing the field of laser dermatology as well as maximizing the health and appearance of your skin. We’ve performed literally hundreds of clinical trials and treated thousands of patients to deliver the best care and support you can find. 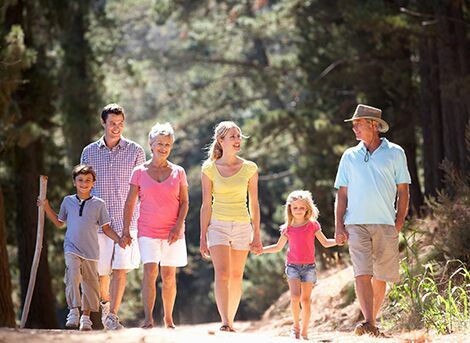 Our research includes studies on dozens of laser devices as well as treatments for leg veins, facial wrinkles, acne scars, loose skin, and more. We have written dozens of papers published in peer-reviewed medical Journals as well as Medical Textbooks on laser, light, and energy based technologies. Our Medical Director, Dr. Mitchel Goldman along with Dr. Richard Fitzpatrick (deceased) have even developed and/or perfected many of the presently used laser devices. Simply put, we’re your go-to laser experts for all your aesthetic needs. To find out more, contact us to schedule a consultation today at Cosmetic Laser Dermatology. What Conditions Will Fraxel Re:Pair Treat? 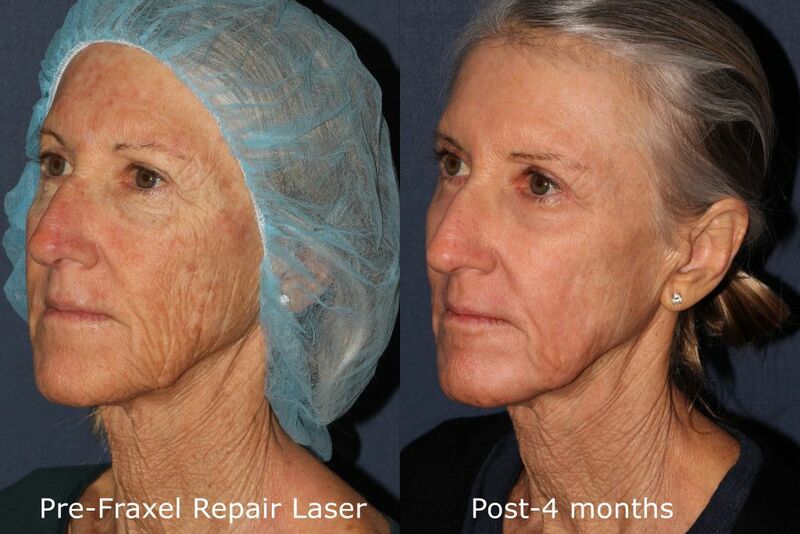 The Fraxel Re:pair laser is designed for dramatic results. In the hands of the laser skin resurfacing experts at Cosmetic Laser Dermatology, it is a safe procedure that delivers results you’ll be happy with. 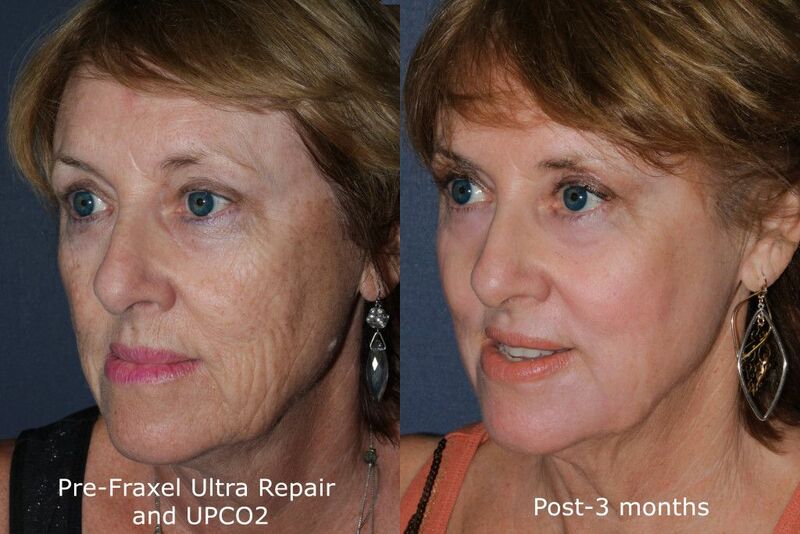 At Cosmetic Laser Dermatology in San Diego, Fraxel Re:pair is one of our more popular procedures. Why? Because it produces dramatic results. If you’re looking for an effective treatment to rejuvenate your appearance, the benefits of Fraxel Re:pair may be just what you want. What we like most about Fraxel Re:pair – and we believe you will, too – is its ability to leave microscopic areas of the skin untouched and unharmed. 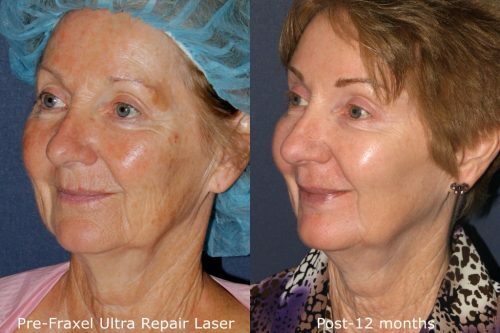 This “fractional” approach means quicker healing compared to older lasers that treated an entire area (even if the entire area need not have been treated). Yet, despite the impressive results, the Fraxel Re:pair is gentle, making it safe for treating such sensitive areas as the neck, hands, chest, and legs. Read our pre/post treatment guidelines for Fraxel treatments. About 60-90 minutes before your procedure, we will apply a topical numbing agent on your skin in the targeted area. For a full procedure on the face, you can expect the session to last 30-45 minutes, while it may take 60+ minutes for other areas like the torso, back, or legs. During treatment, you’ll feel increased levels of heat. Although most patients find this and the accompanying stinging or tingling sensation on the skin to be well tolerated, this varies from patient to patient. Nevertheless, once your session is finished, you should feel comfortable immediately following treatment. Although the Fraxel Re:pair has proven to be more effective than traditional lasers, the recovery time is still significantly less. For 7-10 days, you can expect symptoms like redness, swelling, and crusting. However, these are all good signs that the skin is healing and the deep tissue is being repaired. Recovery varies from patient to patient, though you may want to wait 5-7 days before returning to work or resuming your normal activities. Some patients may experience a persistent redness or a pink tone two weeks or longer. Along with access to over 45 lasers, we are pioneers in dermatologic laser applications. When you come in to see us, depending on your condition and aesthetic goals, we offer an extensive range of non-invasive and minimally invasive solutions. To know more, visit fraxel.com or schedule a consultation with our Fraxel Re:pair laser experts today in San Diego. Calling (858) 943-2113 and our warm, friendly staff will address your concerns and answer your questions about how Fraxel Re:pair can benefit you. Q: What is Fraxel Re:pair? A: Fraxel repair is a popular and very effective type of fractional CO2 laser for resurfacing the skin for a smoother, more youthful-looking appearance. Many of our patients choose this laser when they want a safe treatment that delivers dramatic results. A: The laser energy goes deep into the tissues to stimulate collagen production and repair a variety of skin irregularities, including deep lines and wrinkles, uneven skin tone, sun damage, aging skin, and more. By stimulating your body’s collagen, the skin will be stronger, firmer, and healthier. Q: How many Fraxel Re:pair sessions will I need? A: Most likely, you’ll need 1-2 sessions to experience maximum results, although clinical studies suggest that you’ll see results after only one session. A consultation with our laser experts to assess your needs is the best way to know for sure, as this is when a customized treatment will be designed for you. Q: Is Fraxel Re:pair safe? A: Fraxel Re:pair has been proven safe and gentle on the skin in many clinical trials and studies. In the skilled hands of our experienced laser experts, who have the knowledge to give you precisely the laser skin resurfacing you’re looking for, you’ll experience a decreased risk of side effects while getting the benefits of smoother, more rejuvenated skin. Q: Does Fraxel Re:pair cause pain? A: Before your procedure, you’ll be given a topical anesthetic cream, pain medication, and nerve blocks to numb the general treatment and to ensure maximum comfort. You also have the option of undergoing general anesthesia with a board-certified anesthesiologist in one of our QuadASF-accredited operating rooms. Q: Does Fraxel Re:pair treatment result in downtime? A: This depends on the intensity of the treatment. It will result in approximately a week of social downtime. With a less aggressive treatment, you’ll have less downtime but require more treatment sessions. In this case, you likely will have skin redness and swelling for 1-3 days but can return to your regular schedule shortly after laser treatments. Q: What type of side effects should I expect after Fraxel Re:pair? A: Unlike most laser treatments, Fraxel Re:pair side effects are mild and should subside within a week. Symptoms could include skin irritation/redness, swelling, itching, dry skin, and peeling/flaking. Q: How much does Fraxel Re:pair cost at Cosmetic Laser Dermatology? A: Because each patient has a unique treatment plan, cost varies from patient to patient. For example, if you want minor enhancements, your costs may be lower than if you opt for a more extensive treatment plan. Visit our Promotions page to learn about the latest deals on our services. Contact our laser experts for a consultation and a customized treatment plan based on your needs. Q: How quickly will I see results from Fraxel Re:pair? 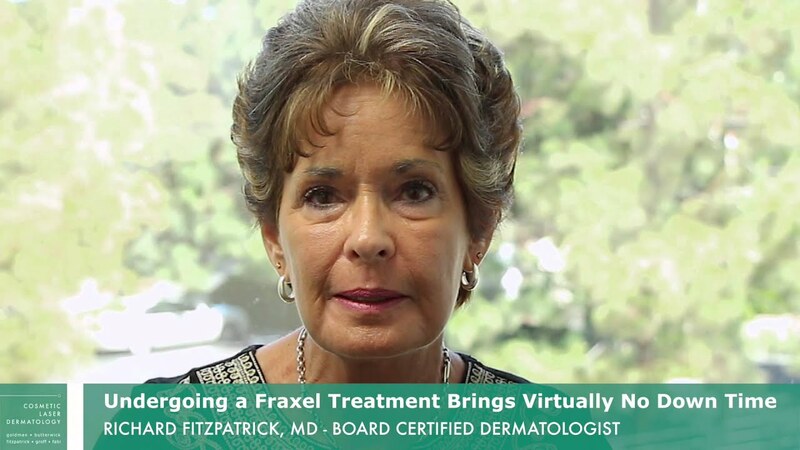 A: Results from Fraxel Re:pair treatments are visible in two stages: immediately and over time. Not long after your first session, you’ll see noticeable improvements in your skin tone and texture. Over the ensuing 2-4 months, as new collagen growth is stimulated and adds volume to your skin, you’ll continue seeing improvements to your skin. You’ll see remarkable results without prolonged recovery time. Q: How long do results from Fraxel Re:pair last? A: Typically, you’ll see long-term results – up to 5 years, even longer in many cases – but the results are not permanent. You can extend the effects by taking proper care of your skin with adequate sun protection and a good daily skincare routine. You’ll find additional treatments from the Fraxel line of laser therapies at Cosmetic Laser Dermatology, including Fraxel Re:store and Fraxel Re:store Dual. We also have lasers such as Ultrapulse CO2, Sciton, Active and Deep FX and Accupulse for laser skin resurfacing as well as Pulse Dye Laser (PDL) and Intense Pulsed Laser (IPL) for excessive redness, blood vessels acne lesions and scars. To know more, contact our dermatologists today to find out more about the skin rejuvenation treatment for you! Purchase a Full Face Fraxel® and Get a Free Clear & Brilliant® + Anti-Antioxidant & Sunscreen. For more information about the monthly specials offered at Cosmetic Laser Dermatology, visit our Promotions page.